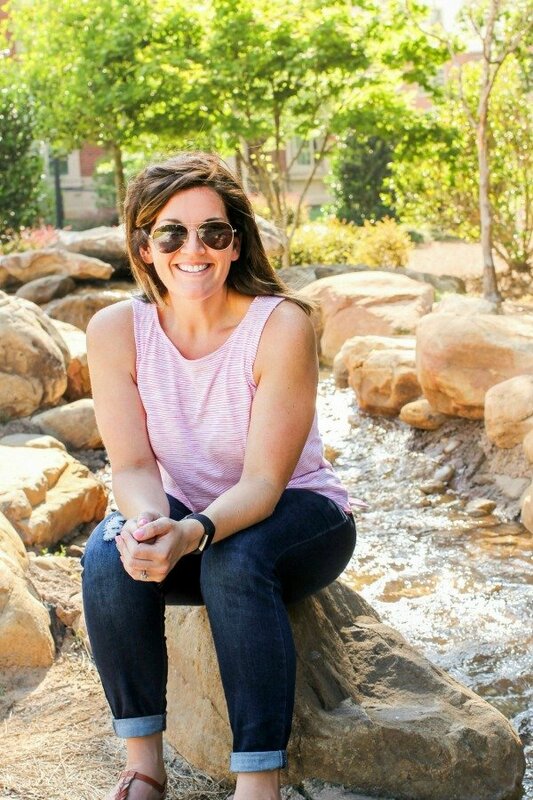 April 11, 2018 By Allyson 9 Comments This post may contain affiliate links. Read my disclosure policy. 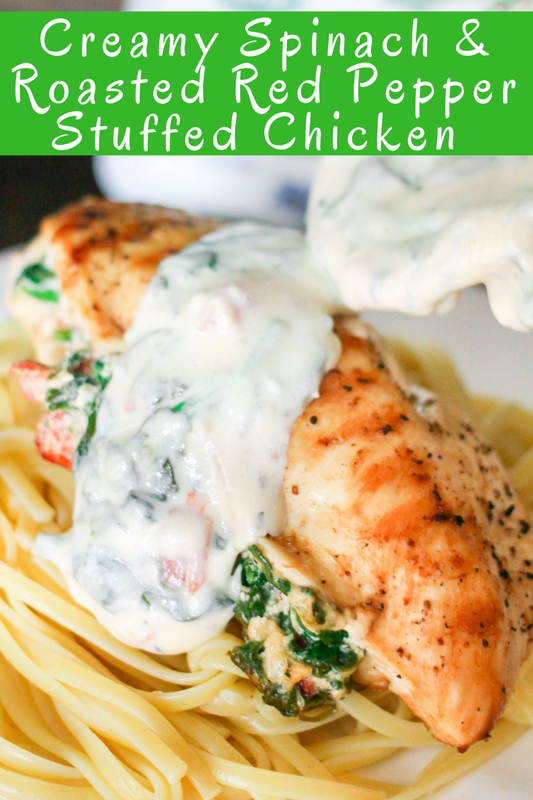 Creamy Stuffed Chicken is an easy yet decadent meal that everyone will love. 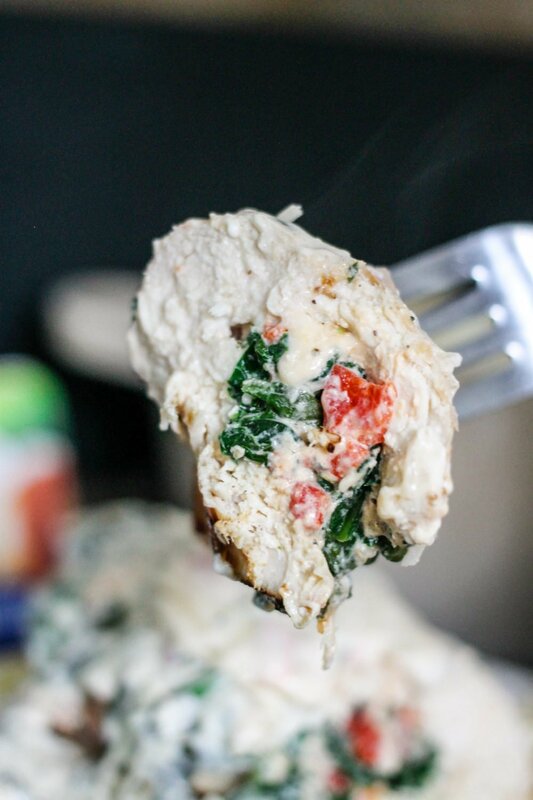 Grilled chicken stuffed with spinach, roasted red peppers, and cream cheese, then topped with a drool-worthy creamy sauce. Whipping up a decadent creamy stuffed chicken dish for dinner probably seems like it takes too much work, but I assure you, it’s actually easy! Your family will think you slaved over this meal for hours, when in reality this easy chicken dinner only takes about 20 minutes to make. You can make the creamy sauce and pasta while the chicken cooks, and it’s done in a snap! This post is sponsored by Arla® Cream Cheese but the content and opinions expressed here are my own. I was so excited to participate in the Chopped at Home challenge, because I love a good challenge. I needed to use Arla® cream cheese in my recipe, as well as a ‘mystery basket’ of other items. These items turned out to be roasted red peppers, chicken, and spinach! 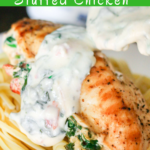 I knew right away I wanted to whip up a creamy stuffed chicken dish. Ever since I started cooking, I have been obsessed with making stuffed chicken. When I was 19 I hosted my first dinner party, and I served a creamy stuffed chicken that had feta and pesto – everyone loved it. I was hooked since then! Gather the ingredients. Mix Arla Original cream cheese, spinach, roasted red peppers, parmesan cheese, and seasonings in a bowl. Slice a pocket into the chicken breasts, taking care not to slice through the bottom or opposite side. I recommend using a small paring knife for this step. Stuff about 1/3 cup of the spinach mixture into the pocket, then seal the seam with a toothpick or two. Reserve remaining spinach mixture. Using a grill pan or an actual grill, place chicken breasts over medium heat, and cook for about 5 minutes on each side. Melt butter and saute garlic in a small sauce pot. Add chopped green onions, remaining Arla Original cream cheese, milk (can use regular, soy, or almond milk), and parmesan cheese; mix until melted and well combined. Add remaining spinach mixture to the sauce; stir in using a fork. Simmer until thickened and everything is melted and combined. Keep over low heat, mixing occasionally until the chicken and pasta are ready. Arla Original cream cheese is made with just 4 simple ingredients (cream, skim milk, cheese culture, and salt) and that’s why it tastes so delicious! I find Arla cream cheese to be better than competitors. It has such a rich, creamy texture, and the taste is simply delicious. Arla cream cheese is free from artificial flavors, preservatives, thickeners and stabilizers and has a better nutrition profile than other common bagel spreads. From breakfast to dinner and everything in between, Arla is the better-for-you cheese the whole family will love. Arla is a farm-to-fridge dairy, so the fresh milk for the naturally delicious cream cheese comes directly from farms owned by Arla’s proud farmers. Find Arla Cream Cheese at a store near you. I personally recommend serving Creamy Stuffed Chicken over pasta. Using whole wheat pasta or linguine would be great options. The sauce is SO delicious that you need to have another venue to enjoy it; pasta is perfect. Cutting carbs? 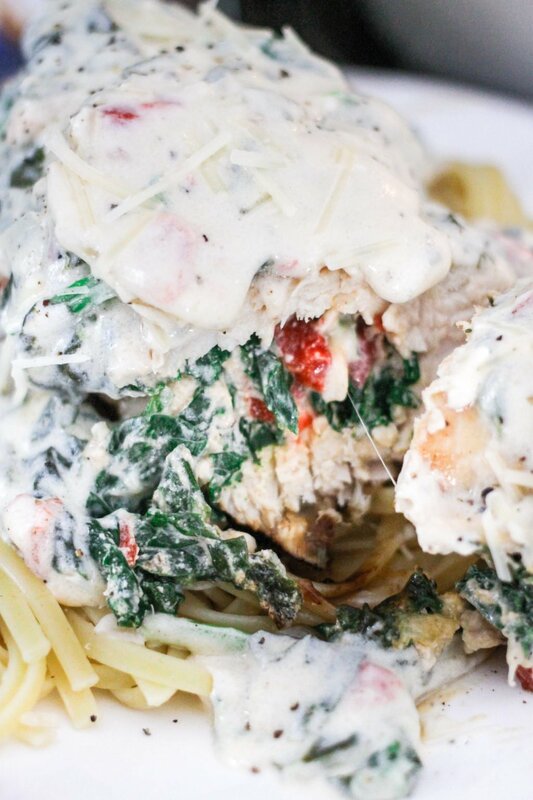 Serve Creamy Stuffed Chicken over Zucchini Noodles. Zucchini noodles have the perfect texture to compliment this recipe. Another great option would be to serve this Creamy Chicken over cauliflower rice. The sauce would really bring together the cauliflower rice and almost mimic a ‘mac’ and cheese. Now it’s YOUR turn! You can enter the Chopped at Home Challenge by Arla for yourself! This contest is running on FoodNetwork.com in partnership with Arla. 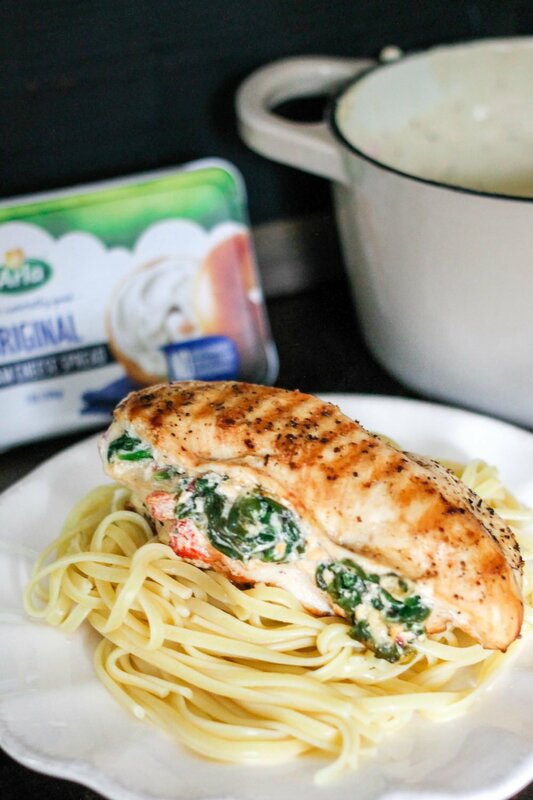 Users will be asked to enter using the four mystery basket ingredients – Arla cream cheese (any flavor), chicken breast, baby spinach and roasted red bell pepper – to create an original dish. Upload a description of the recipe along with a photo of the finished dish that includes the Arla packaging in the shot. The winner will be selected based on appetite appeal (35%), creativity and incorporation of basket ingredients (15%), appearance and presentation (15%) and clarity of dish description (35%). There will be one grand prize winner that will received $5,000 cash and a gift basket containing Arla products and helpful kitchen items worth an estimated $350. The contest will run from 9:00 AM EST on 4/10/18 to 4:59 PM EST on 6/1/18. 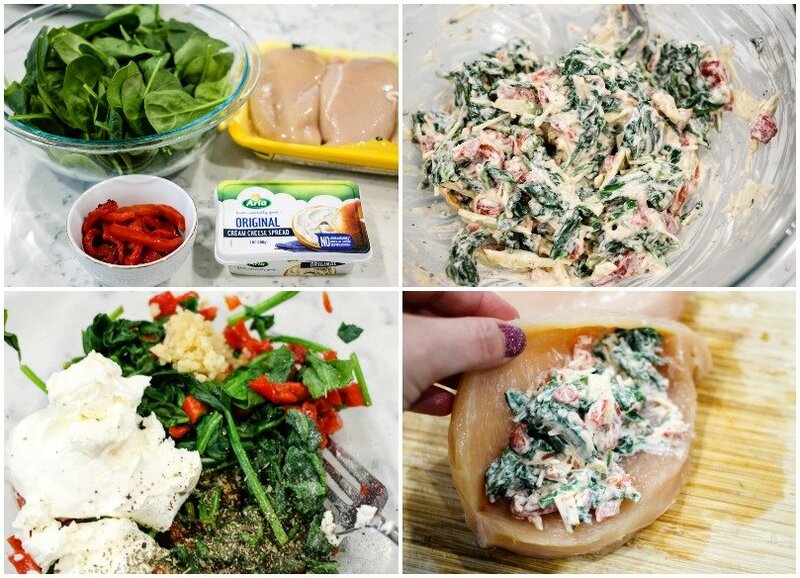 Mix Arla Original cream cheese, spinach, roasted red peppers, parmesan cheese, garlic, and basil in a bowl. Slice a pocket into the chicken breasts, taking care not to slice through the bottom or opposite side. **I recommend using a small paring knife for this step. Season tops and bottoms of chicken breasts with salt and pepper. Using a grill pan or an actual grill, place chicken breasts over medium heat, and cook for about 5 minutes on each side or until cooked through. Remove from heat and set aside. In a small sauce pot, melt butter and saute garlic. Add chopped green onions, Arla Original cream cheese, milk, and parmesan cheese; mix until melted and well combined. Add remaining spinach mixture to the sauce; stir in using a fork. Simmer until thickened and everything is melted and combined. Keep over low heat, mixing occasionally until the chicken and pasta are ready. This has layers and layers of amazing flavors! I can’t wait to dig into this dish! This chicken does look creamy!! I know! It is such a quick dinner! I have to add this to my dinner menu! It looks so good! Holy moly does that chicken look good! I am putting it down on my menu to make soon! I am drooling over this! I can’t wait to make these. I know my family is going to love this chicken dinner. Looks perfect! I love anything creamy and stuffed. This looks AWESOME!